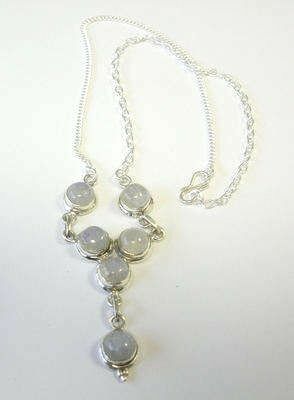 Gorgeous milky white moonstone and silve necklace. This is a terrific necklace with 6 beautiful milky white round moonstones. Each lovely bead is set in plain silver and all the stones are linked to each other with silver chain links with 2 moonstones coming down to hang nice and floaty towards the chest.